2 Bedroom 2 Bath Condo Completely Renovated with unobstructed Gulf views!!! 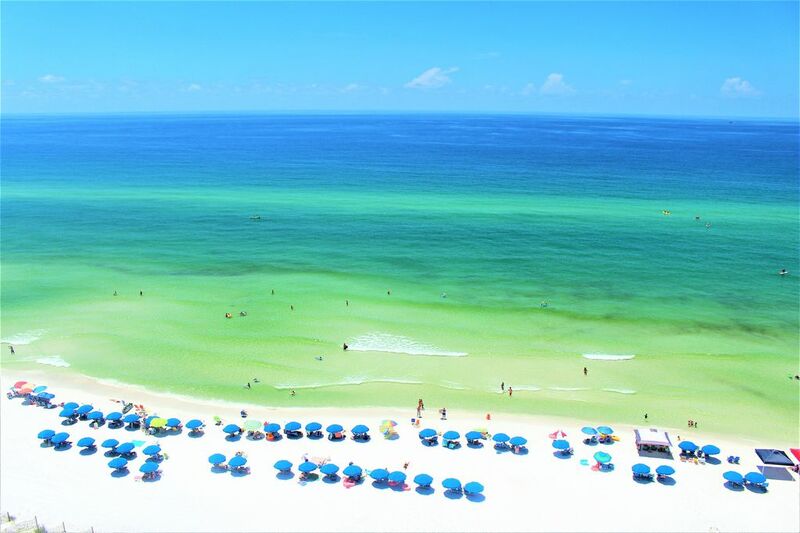 Our condo is perfectly located directly on the sugary white sand beaches of the Gulf of Mexico in Seagrove Beach, FL which is between Seaside and Rosemary Beach on 30A and is 20 minutes from Destin and 20 minutes from Panama City Beach. The sugary white sand beaches of the Gulf of Mexico are accessible through the private boardwalk (be on the beach within 2 minutes of leaving your condo door!). 30A Beaches have been ranked the #1 most beautiful beaches in the USA. Our condo has unobstructed views to both the East and West to enjoy breathtaking sunrises as well as sunsets.With this unit being completely renovated and completely refurnished and decorated it is the the nicest unit in the building! Compare to all other properties in the Beachcrest building and you will NOT find a nicer unit. Rest up in our professionally decorated unit on brand new beauty rest mattresses and enjoy the beach or pool the next day! On the beach we have included 2 chairs and umbrella complementary with your stay during the seasonal beach chair service. There is also beach service available to rent kayaks and paddle boards next to our beach access. If you prefer the pool, it is ocean front and accessible within 2 minutes of leaving your condo door. So bring your swimsuits no matter what time of year as the pool is heated to 85 degrees from October through April and right next to it are two well-maintained gas grills. Enjoy the beautiful sunrise with a coffee and end the day with a cold beverage watching the breathtaking sunsets from the balcony dining set. After a fun and exciting day at the beach or pool you can relax in our newly renovated condo which features 3 smart TVs so you can be connected and login to Netflix, Hulu, amazon, and any other TV apps. Cable is also included along with Hi Speed WiFi. The kitchen is equipped with high end Bosch stainless steel appliances and all of the necessary cooking utensils needed to prepare a meal of any size. The Condo has beautiful tile floors throughout, marble shower in master bathroom, professionally decorated and designed and is a two bedroom condo with an ocean front Master bedroom featuring an on-suite bathroom and an extra bedroom with a King size bedroom set. The ocean front living room/dining room opens up to the kitchen and has a queen sized sleeper sofa. Our condo has a full size washer and dryer located in the unit, a fully stocked kitchen including a keurig coffee maker, 2 parking spots, and sleeps 6 very comfortably. Beachcrest is located not only close to Seaside but also a short distance from Rosemary Beach and Alys Beach which provide top notch restaurants and shopping. There's so much that you can do and explore along 30A that 1 week may not be enough! If you enjoy Bike Riding or taking a Run we are located on the famed 30A which has a 19 mile asphalt running and biking path! Park your car and never have to get in it your entire stay! As a vacation rental by owner, we know the value of having certain "Perks" when you arrive on vacation and that is why we have included a starter of toilet paper, paper towels, and of course fresh towels in each bathroom. Located very close "within biking distance" is Grayton Beach State Park, many coastal dune lakes, and 100's of miles of biking paths through the state parks surrounding the area. Our goal is to help create more than just a nice vacation but to help create memories for years to come. Create a memory that will not soon be forgotten and let others know what your favorite thing to do along 30A is! Owners are on site each week to make sure the condo stays in tip top shape so you can enjoy your vacation. Hi, As a fellow traveler we know what you want when you arrive to a condo you are spending your hard earned money on for a peaceful vacation and we strive to provide this to each and every traveler. From our "Rejuvenation Pack" to making sure our condo is professionally cleaned and maintained each and every time a checkout occurs by being on site and inspecting we take pride in making your vacation one you can remember! We completely renovated this unit in 2017. This was a full gut and renovation project, everything including the drywall was removed and this unit has been updated with everything from new wiring, plumbing, drywall, to the most luxurious of finishes and furnishings. You will not find a nicer condo unit along 30A. We spared no expense in making this unit the best it could be for years of enjoyment to come. Unit 604 Beachcrest Condominiums is the nicest unit in the Building. Each unit we own we take the necessary steps to make sure everything is in working order so you can enjoy your vacation instead of making unnecessary calls about needing repairs. We live within 10 minutes of the building so if any issues arise during your stay you can be ensured that they will be handled right away. Located in Santa Rosa Beach Florida, 20 minutes to Panama City Beach Florida and 20 minutes to Destin Florida our Beachcrest 604 is set in a picturesque part of 30A which provides views of the Gulf unlike any others all while providing an intimate setting to enjoy either a one on one get away or a family vacation alike!!! Unit 604 Beachcrest Conominumns is the nicest unit in the Building. Each unit we own we take the necessary steps to make sure everything is in working order so you can enjoy your vacation instead of making unnecessary calls about needing repairs. Located in Santa Rosa Beach Florida, 20 minutes to Panama City Beach Florida and 20 minutes to Destin Florida our Beachcrest 604 is set in a picturesque part of 30A which provides views of the Gulf unlike any others all while providing an intimate setting to enjoy either a one on one get away or a family vacation alike!!! Master bathroom includes full size walk in tiled shower. Second bathroom includes full size bathtub and shower. Parking for 2 vehicles included at NO additional charge on site within 50' of the elevator. Beachcrest has extremely fast elevators. You will not be waiting for an elevator! Spacious living room with brand new Pottery Barn furniture. Enjoy every moment viewing the beautiful crystal blue waters of the gulf from the Living Room!!!! Full size refrigerator for all of your cold beverages to enjoy on the balcony looking at the beautiful unobstructed Caribbean like waters of the Gulf of Mexico!!! Keurig Coffee Maker along with a conventional coffee maker included for your convenience! Have a hot cup of coffee on the balcony watching the dolphins splash around after a beautiful sunrise!!! We do provide a toaster for bagels, toast, etc....:) Enjoy a wonderful breakfast on the balcony with the beautiful views of the Gulf of Mexico for as far as you can see!!! The kitchen is fully stocked with all of the essentials to prepare a meal of any size, all plates, cups, knives, forks, spoons, cooking utensils, etc... are located in the kitchen. Amazing kithcen with new Bosch appliances. Fullsize Kitchen with all of the essentials to prepare a meal of any size. Keurig Coffee maker as well as a conventional coffee maker for your convenience. Large smart TV's in the Master Bedroom, Living Room, and Guest Bedroom. Connect to all of your favorite apps such as Hulu, Netflix, Vudu, and Amazon Prime!!!! Large balcony connecting the Living Room to the Master Bedroom with unobstructed views for as far as the eye can see in both directions. Dining table and lounge chair on the balcony. Kayak and Paddle Board rental available by the boardwalk or directly across the road at Butterfly Kayak and Bike Rentals!!!! Bicycles can be rented across the street from the condo. Kayak and Paddle Board rental available by the boardwalk or directly across the road at Butterfly Kayak and Bike Rentals!!!! Large pool which is heated to 85 degrees from October through April!!!! Beachcrest condominium is the go to spot for a relaxing 'park your car and leave it' vacation on 30A! Everything you could possibly need is withing walking or bike riding distance including grocery store, restaurants, liquor store, donut shop, smoothie shop, meat and deli, seafood store, bike and kayak rentals, paddle board rentals, beach toy store, and massage studio. The views from our unit 604 are unmatched to any unit along 30 A providing 100% unobstructed views to the west and 100% unbostructed views to the East, you can NOT find a more picturesque setting. Our unit 604 is also professionally decorated and designed for functionality and tranquility to provide the most peaceful vacation imaginable. If you need anything during your stay do NOT hesitate to contact us! We truly hope you enjoy your stay and make it a place for a reoccurring yearly vacation!!! Gorgeous condo and perfect location! So easy to access beach. Beautiful views from kitchen, living area and master. The balcony exceeded expectations in size. We even had a couple of meals out there! Loved staying here and will be back! Dated building but clean and convenient with beautiful beaches! A great location, nice waterfront unit that was just right for our family. Thank you for the excellent review. We are so pleased that you enjoyed our condo. If you are back in the area in the future we would love to have you stay again. Thanks again for the booking!!! Thank your for the excellent review. We enjoyed our stay as well as the view. Thank you for the 5* review it is greatly appreciated. Perfect views of the sunrise & sunset from the balcony! Wonderful beach access! We felt right at home when we arrived. Would love to own something just like this one day. Loved the decor and wood tile. Only wish we could have stayed longer than one night! Hoping to be back soon!